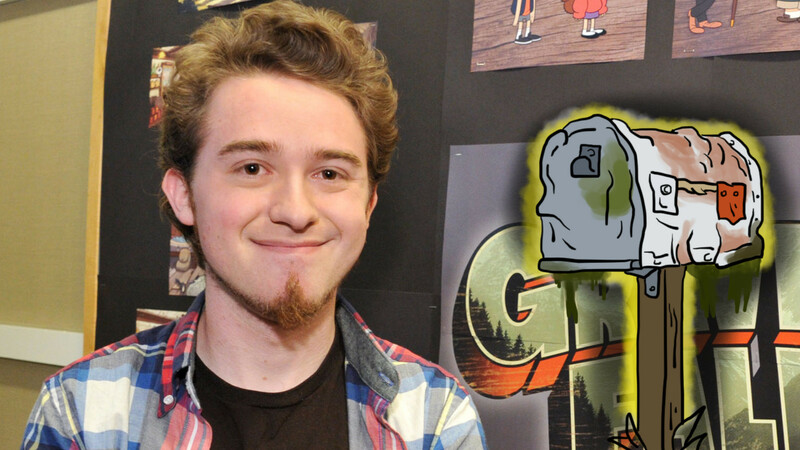 Alexander Robert "Alex" Hirsch (born June 18, 1985) is the creator of the Disney show, Gravity Falls, where he also provides the voices of many characters, including Stan Pines and Jesus "Soos" Alzamirano Ramirez. He based a lot of the series on his own childhood experiences. Prior to Gravity Falls, he got his start at Cartoon Network storyboarding on The Marvelous Misadventures of Flapjack (Pendleton Ward of Adventure Time fame was his board partner). He went on to co-develop Fish Hooks for Disney before moving onto his masterpiece. After Gravity Falls ended its run in 2016 (with the stated intention of avoiding Seasonal Rot). He also became involved with the film-making industry, providing some contributions for the stories of Pokémon: Detective Pikachu and Spider-Man: Into the Spider-Verse, but left both during pre-production. He recently wrote two Interquel works for Gravity Falls: a Defictionalization of the iconic Journal 3, and a graphic novel titled Gravity Falls: Lost Legends. Gravity Falls: Stan Pines, Soos Ramirez, Old Man McGucket, Bill Cipher, Jeff, Shmebulock, Carson, Steve, Jason, Nate, Constable, Ducktective, Grampton St. Rumpterfrabble, Paper Jam Dipper, Quentin Trembley, Sev'ral Timez, Chadley, Mayor Befufftlefumpter, Shmebulock Senior, Ducktective's twin brother, Fairy dust dealer, Dippy Fresh, and the Horrifying, Sweaty, One-Armed Monstrosity after Louis C.K. 's sexual misconduct came to light. Man of a Thousand Voices: Each of the characters that he voices sounds vastly different. Playing Gertrude: He was nearing his 30s during Gravity Falls' run, yet he voiced the 60+ Stan Pines, Old Man McGucket, and the 100+ Mayor Befufftlefumpter. Alex replied to a tweet regarding season two that "at least one character will not survive the season. Buckle up". Mayor Befufftlefumpter, a 100+ year-old minor character, passed on. The most famous and the reason he's the picture: creating a fake spoiler image of McGucket writing in one of the journals to throw fans off, "leaked" said image onto 4chan, posted a tweet feigning anger and later deleting said tweet, then gloating in a later tweet about the whole thing after "Society of the Blind Eye" aired (where it was revealed that McGucket was merely an assistant to the Author, not the Author himself). Fans had theorized about the purpose of the ten symbols depicted around Bill at the end of the theme song, "Dreamscaperers" and "The Stanchurian Candidate": In "Weirdmageddon 3: Take Back The Falls", the Zodiac turns out to relate to a prophecy to defeat Billand ends up never being used. Gravity Falls was based on trips Hirsch and his sister took with their grand-aunt. The episode "Dungeons, Dungeons, and More Dungeons" was based on attending a Dungeons & Dragons game with Adventure Time creator Pendleton Ward and Over the Garden Wall creator Patrick McHale during the trio's time on The Marvelous Misadventures of Flapjack. Write Who You Know: Gravity Falls was mostly based on Alex Hirsch's childhood, with Mabel based on his sister Ariel, Stan based on their grandfather, Soos based on a roommate of Alex's, Wendy based on a girl Alex had a crush on, and a number of Wendy's ex-boyfriends were named after many of Ariel's.